This article, written in 1992, first appeared in Tattva-Sangarba, the journal of the Sringiri Shankaracharia Math, India. A portion was also published in Tantra Magazine and Light of Consciousness. There’s a sacred wind blowing, heralding the dawn of mysticism. I feel it, my friends feel it, and the news media has started writing about it. We are waiting with bated breath for the day to come when mystics will inhabit the world, when Christians, Muslims, Jews and Hindus get so intoxicated with love for the God of their heart that their differences melt into a giant pot of divine love. When I close my eyes and think about it, I can almost taste what a world consummated by collective mystical union could be like. A mystic in my dictionary is someone who, over and above his or her spiritual and/or intellectual disciplines, is in perfect tune with the consciousness underlying all-the very thing we all have in common and that which differentiates a live person from a dead body. Everybody is hooked into this life-giving consciousness, but only few enjoy its divine bliss and splendor. A mystic enjoys the glamour of God because he or she has managed to shake off the ego, which is the only thing that separates us and prevents lasting happiness. We’re living in a time when things are getting ready for change. As we approach the millennium, suddenly old beliefs we’ve lain in comfortably for so many years don’t hold any longer, baring the field of doctrine to a tempest which may reshape Western religious and intellectual thought. On the spiritual side, there is turmoil. Organized religions have trouble keeping their formalities flexible enough to accommodate people’s desire for a more personalized religion. I believe that people want to practice yoga whether they call it by this name or not. They want to have their own personal connection with God and put sacredness back into every aspect of their daily lives. People are reaching out to spirituality, something that can be substantiated by the fact that Pope John Paul II’s new book, Crossing the Threshold of Hope topped the best-seller list, bypassing Faye Resnick’s raunchy tell-all book about Nicole Brown Simpson. On the scholarly side, there is turmoil. Faith in secular, rationalist humanism-with progress as the promise and reason as the tool-is eroding for the first time since this philosophy germinated in the Renaissance. Rationalist humanism made us believe we could discover the “laws of nature” through reason and, applying this knowledge, things would get better and better. And since we’ve failed to harness nature over all these years, the voices of advocates of the chaos theory are now getting louder, undermining the conventional theories of rationalist humanism. According to the chaos theory, we’re living in a universe of chaos where change is the norm, and where change without end does not necessarily mean we are progressing toward anything better. As a lover of the Hindu Goddess Kali, I have no problem with chaos. I see it as Ma Kali’s divinely intoxicated dance. As the destroyer, Kali clears the path for new creation. Shouting, “Off with the ego!” the great Queen of the Universe clothes Herself in chaos so awesome that our arrogance automatically falls off, giving way to unconditional surrender. This black goddess Kali is mysticism personified. As such, She has a tremendous unifying power. She intoxicates us, fermenting us into the same wine. I’ve been privy to gain first-hand knowledge of this. Over the past couple of years, I have sponsored public Kali pujas held in Laguna Beach, California, performed by Sri Haradhan Chakraborti, the main pujari (priest) of the Dakshineswar Kali Temple. So many blissful faces, so many diverse people worshipping side by side-Westerners and Indian, people from the Vedanta Society, SRF, Yoga Center, ISKCON and followers of a veritable rainbow of yogis and yoginis too numerous to list. 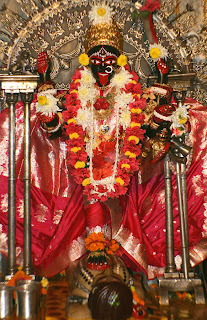 The first time I felt like abandoning myself to the divine will was when I first saw Ma Kali’s face in the inner sanctum of the Dakshineswar Kali Temple, Calcutta, India. I was so awed that I forgot to ask Her for anything, not even to straighten out any of my problems. All I wanted was to let go of myself just like a child lets go of the string, releasing the balloon to ascend toward the vast blue sky. Perhaps this feeling of wild abandonment was caused by the inexplicable ecstatic joy I fest at the time, or perhaps it was just the noise of my rapidly beating heart that drove away my thoughts. Whatever the reason, this feeling came to me quite naturally and was not something I deliberately manufactured. Yet, what seemed so easy a thing to accomplish at first has turned into the hardest task I have ever attempted. Years have passed, and I still don’t know how to completely surrender at Ma Kali’s feet. It’s a vicious cycle. The more I long to surrender, the deeper my understanding gets of what it means to surrender to the Divine. One moment I feel I have done it; the next, I realize how much farther I need to go. I found Kali-or She found me-in 1986 while I was traveling in India on assignment for a magazine. I was immediately overwhelmed by the very tangible power one feels in Her presence, and I got frustrated when I could not find enough information on this mystical black goddess. I had so many questions and could find no books written about Her in a language my heart could understand. So, I began research and wrote one myself. Today, I am a lot wealthier. Ma Kali’s presence in my heart reversed, as it were, the current of love within me. Previously, this current flowed from the outside in and made me depend on favorable external influences. Now, it flows from the inside out. When I stopped depending on people to love me and started listening to and feeling the love in my own exciting heart, the current of love reversed. If only people would become lovers rather than wanting to be beloveds, there would be a lot less hurt and hatred in the world. It’s much easier to be a lover because the ego gets less in the way. As a lover, I am more prone to love unconditionally, without expectations. As a lover, I seek happiness more for my beloved than for myself. It encourages me to be unselfish. In my case, unselfishness did not come over night. I’m still working on it and have a long way to go. 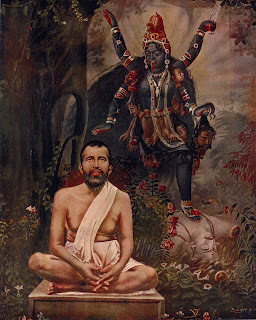 My ideal is Sri Ramakrishna, the Godman who lived at the Dakshineswar Kali Temple for 30 years. His passionate love and total surrender to Kali united his being with Hers, making Her will and his inseparable. But it’s certainly worth it. The more I go about loving unselfishly, the deeper the feeling of satisfaction. It is my sincere belief that as long as I am unselfish and live in tune with God, my love will always be replenished. I’ll never run our of love, even if the people I love hurt me. I may not be immune to getting hurt, but when I do, underneath the tears continues to flow a sweet current of bliss. To me, surrender to God means to live constantly in tune with God. This is, indeed, a very hard thing to do. The belief that I am not the doer and Ma Kali is doing something through me comes with practice. It shouldn’t be wishful thinking or come from an emotional sentiment that may land me in a mental institution. When it is real and true, it is a tangible feeling beyond doubt. I have met many people who I thought had attained great spiritual heights. But, after spending time with them, I discovered that their talk and behavior was based on past spiritual experiences and learned behavior-which is certainly not bad. But, God cannot be realized in the past or future. God can only be realized in the present. It is truly rare and great good fortune to meet someone who lives in the present moment and whose spirituality bubbles spontaneously from the heart. When one lives constantly in tune with God, every word, every action is spontaneous. Even when one repeats God’s name a thousand times, each repetition is fresh and completely spontaneous. One thing all Kali worshippers I met have in common is a sense of fearlessness. I don’t have to be afraid of anything for I worship the Mother who gives birth and destroys all things created. So, whom or what to fear? 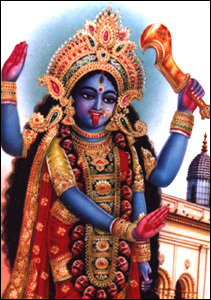 Ma Jaya Sati Bhagavati, one of the most vivacious American spiritual teachers I know, has turned Kali worship into a most practical application. Ma Jaya gives Kali to people afflicted with AIDS. She tells them, “I can’t cure you, but I can teach you how to die fearlessly in the Mother’s arms.” Ma Jaya, who is also an artist, activist and humanitarian, is the founder of the Kashi Foundation in Sebastian, Florida. One can read a lot about spirituality and surrender, but one doesn’t get the taste for it until one experiences it. It helps to spend time in the company of the holy, people who have dedicated their lives to realize God. Their company stimulates sacred emotion, which, in turn, overpowers mere analytical thought. The closer one gets to the inner shrine, the louder one hears throaty shouts that echo from within the temple. “Ma, oh Ma, Ma go Ma! Jai Kali! Jai Kali Ma! Jai Ma Bhavatarini ji ki jai!” One also hears the loud clanking of a bell that rings in spurts. Yet, one still cant see anything in front besides heads and raised arms. The front entrance to the Kali shrine has three arched passageways. Because the middle one is blocked, worshippers enter and exit at both sides. Today, it is very crowded, and one is shoved through. Cold sweat stands on the forehead as one suddenly finds oneself inside a cool covered veranda. It is quite cool although there in no visible air-conditioning system. Toward the left, suspended from the ceiling, hangs a big brass bell. Every other pilgrim who is pushed past, reaches up and clanks it as loudly as possible at least a couple of times. Parents hold up their children to give them also a chance to clank the bell, thereby proclaiming to Ma Kali that they have arrived, that they exist. Countless bare feet shuffle over the cool, smooth marble tiles. Occasionally one steps on something slippery and wonders what it is. Perhaps it’s a flower, spilled water, something indefinable that is better not to know. Whatever it is, one will never know because there is no chance to see the ground. There are too many bodies, pushing, pressing and crowding like moths in the night toward a light that is still a little farther off. Everyone’s focus is on the lighted entrance in the middle of the covered veranda. A cast-iron gate prevents people from entering, so they crowd before it, half hanging over it, trying to get a little closer inside. Some people kneel, reach through the gate and touch the ground within the sanctum. Immediately behind the gate stand two priests keeping watch. There white dhotis bear the marks of their profession-red sandalwood paste, vermilion and flower stains. Their foreheads are marked with large vertical lives of vermilion, the signs of a male Shakti worshipper-women wear large vermilion dots. Pilgrims hand their baskets of offerings to attending priests, who take the hibiscus garlands and expertly fling them into the lighted inner sanctum at Mother Kali’s feet. Basket in hand, each priest disappears inside, utters some mantras over the basket and offers it to Mother Kali with reverence. A few sweets from each basket stay with Ma Kali in a box next to the altar. The rest of the offerings, together with flowers taken from the altar, are returned to the pilgrim. These returned offerings are called prasad and considered a great blessing. God has taken the first bite-eaten the subtle essence of the food-and the devotee, swallowing the gross elements of the food, takes the second. Anxiety has reached a fever pitch, and the short distance walk from the arched passageway to the lighted inner sanctum seems to take forever. But, when one finally stands before Kali, time seems to stand still. Everything stops. The people, the noise-all is mysteriously gone. One stares with wide eyes, forgetting even to blink. All one sees is Kali and nothing else. Nobody can define Kali, the mystical black goddess. My book is just a blueprint, an attempt to take people a little closer to the realm of Kali. After a talk in a Berkeley bookshop, one person came to me and said, “When you talk about Kali, you talk about love, whereas I and my group look at Her as a militant, liberated woman. She kills all the demons single-handedly. How do you reconcile the two views?” Pointing to the garland of skulls Mother Kali is wearing, I used an observation Betty Lundsted, my publisher, made some time ago. When you look closely at the severed heads, you see that they are all smiling. They are smiling because Ma Kali killed their egos. After they were liberated, only love remained. if u want to know more about the black goddess kali, you please go to ISHA YOGA CENTER VELLANGIRI COIMBATORE IN TAMIL NADU. RECENTLY CONSECRATED POWERFUL LINGABHAIRAVI SHE IS THERE GIVING LOT OF HER BLESSINGS AND GRACE TO ALL OF THEM. I have gone through your details very attentively and right now I have tears in my eyes by just thinking that how much love Ma Kali has showered on you. Simply one request: Please just pray to the Gracious Mother for Her ANUGRAH on me also for which I shall ever remain grateful to you. I would like to put my head on your lotus feet since you love to my Mother Maa Kali. Also, please let me know as to how I can reach to the book (in India) written by you. Please shower your blessings on me... please. With my best love, charanvandana and regards to you and your family. Thanks for sharing such useful information. Keep posting such posts. Very useful post. Thanks for sharing. To the west of the vast temple courtyard stand 12 Shiva temples of Bengali aatchala (eight-roofs) style in a row. Sri Ramakrishna spent many years in the chamber to the north-west, a little beyond the last of the Shiva temples. Some of the most important events in this enlightened soul’s life took place at the Dakshineshwar Kali Temple. A four-poster bed with his garlanded photograph is seen here. Explore more about Dakshineshwar Kali Temple. Govinda I shall not fight! How do I proceed beyond this simple and seemingly sensible declaration? How can I be self-aware yet without ego? My ego is annoyed with itself, disgusted and ashamed. I consider boredom far better than the prospect of this futile, pointless fight. I long simply to return to Godhead and live without self-awareness rather to engage in ghastly war. If only I could cross the endlessly tempting world ocean, disinterested in it, and return home. Please petition God on my behalf to grant me the grace of eternal liberation. I have been a beggar at Her feet so long I fear I have become unnoticeable. I am overwhelmed by dread, contemplating the past and future and their possible influence on the present eternally. I am Sangat. 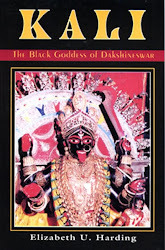 Intimate and detailed description of Kolkata's famous Dakshineswar temple and Ma Bhavatarini, the form of Kali worshipped there. Learn about the temple's festivals & daily rituals, and discover inspiring accounts of some of this traditions ecstatic saints. A great introduction to Kali worship. Quality paperback. 309 pp. with original photographs.